A warm welcome awaits you at the Bettle and Chisel. 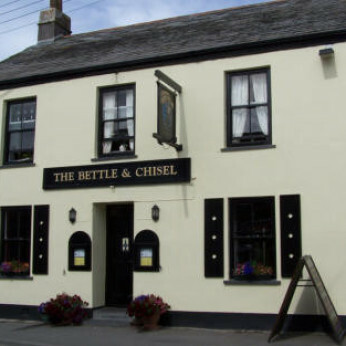 The Bettle and Chisel is a listed Inn situated in the heart of the North Cornish village of Delabole, just one mile from the coast. Ideally located for exploring North Cornwall's hidden treasures. Tents and Tourers can pitch up in our quiet campsite directly behind the Inn. Entertainment most weekends throughout the summer. You will be met with a warm and friendly welcome, hand pulled ales and beers and a varied menu of appetising food for you to enjoy in our Restaurant. "Our guests are our number one priority""We look forward to serving you in the near future"